The role of contrails in climate change is still under study, but some scientists believe that they contribute to the greenhouse effect by trapping heat in Earth's atmosphere. Nicola Stuber, first author of the study, to be published in tomorrow's edition of the journal Nature, suggests that contrails' overall impact on climate change is similar in scope to that of aircrafts' carbon dioxide (CO2) emissions over a hundred-year period. However, they also trap energy in Earth's atmosphere and boost the warming effect, the study says. 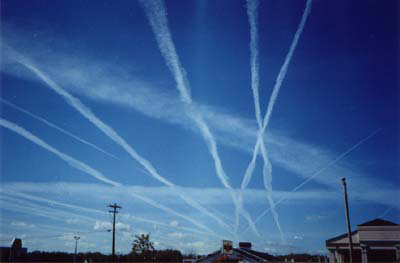 "On average the greenhouse warming effect dominates [the effects of contrails]," said Stuber, a meteorologist at England's University of Reading. This warming effect is far greater for contrails left by night flights, Stuber added. "The solar cooling effect [wherein contrails reflect the sun's rays back into space] only happens during the day, when the sun is up," she explained. "During the night the greenhouse warming is no longer balanced, and that is why the contribution of nighttime flights is so large." Most commercial airline traffic occurs during daylight hours.